I picked this kitsch marvel up from a postcard and stamp collectors' stall on Piazza Borghese in Rome the other day - I couldn't resist it! The postcard is entitled Betty...è una bella bambolina! 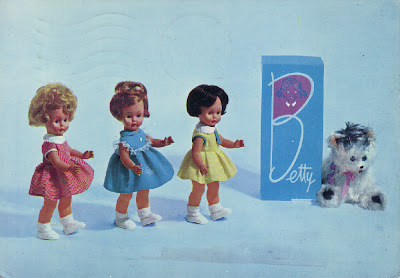 (literally translated - Betty is a beautiful little doll) and was printed as an advertising postcard by famous Italian doll manufacturer Sebino who produced the Cicciobello baby dolls during the 1970s. The postcard was posted to Rome from Florence on 5 January, 1967.